Lucy Fischer is Professor of Film Studies and English at the University of Pittsburgh and Director of the Film Studies Program. Her books include Jacques Tati, Shot/Countershot: Film Tradition and Women's Cinema, Imitation of Life, and Cinematernity: Film, Motherhood, Genre. Widely published, she has served as a curator at the Museum of Modern Art and the Carnegie Museum of Art. Professor Fischer has served as Vice-President and President-elect of the Society of Cinema Studies. Mark Franko is Professor of Dance and Performance Studies at the University of California, Santa Cruz. He is the author of Dancing Modernism/Performing Politics, Dance as Text: Ideologies of the Baroque Body, The Dancing Body in Renaissance Choreography, and co-editor of Acting on the Past: Historical Performance Across the Disciplines. His research has received support from the Getty Research Center, The American Philosophical Society, and the American Council of Learned Societies. He is also the director of the NovAntiqua dance company, which is based in San Francisco.Barbara Hammer is a film- and video maker of seventy-five works, including four feature documentaries: Nitrate Kisses , Out in South Africa, Tender Fictions, and The Female Closet. Her films have played at major festivals including Sundance, Berlin, Toronto, Yamagata, and Festival de Films des Femmes, Creteil, France. Among the awards she has received are an Artist Fellowship from The Japan Foundation, a New York State Council on the Arts Film Production Grant, and a National Endowment for the Arts Film Production Grant. Ute Holl is a filmmaker and historian living in Germany. She wrote her dissertation, Cybernetics and Cinema, at Humboldt University, Berlin, and has edited a German edition of Maya Deren's writings for Hochschule für Bildende Künste, Hamburg. She is preparing a documentary film on the cultural impact of medical imaging. Renata Jackson wrote her dissertation, Voices of Maya Deren: Theme and Variation, at New York University. She has taught at Pennsylvania State University, Emerson College, The European Institute for International Communication in Maastricht, the Netherlands, and at New York University. She has taught critical studies in the School of Filmmaking at the North Carolina School of the Arts since 1998. Annette Michelson is Professor of Cinema Studies at New York University. Her research addresses issues of practice and theory within the various forms and periods of the cinematic avant-garde. She is a founder of the journal October as well as of October Books and editor of October: The First Decade. Professor Michelson has introduced and edited Kino-eye: The Writings of Dziga Vertov and Cinema, Censorship, and the State: The Writings of Nagisa Oshima. Among her other publications are studies of Marcel Duchamp, Joseph Cornell, Andy Warhol, S.M. Eisenstein, Jean-Luc Godard, and Jean Renoir. She is a co-author of The Art of Moving Shadows for the National Gallery of Art. Bill Nichols is Professor of Cinema and Director of the Graduate Program in Cinema Studies at San Francisco State University. In addition to the two-volume anthology, Movies and Methods, he has authored Ideology and the Image, Representing Reality and Blurred Boundaries, along with over fifty articles on a wide variety of subjects. He is a former President of the Society for Cinema Studies and has served as an expert witness in court cases involving intellectual property rights and film. Introduction to Documentary is his latest book. Maria Pramaggiore is Associate Professor of Film Studies and of Women's and Gender Studies at North Carolina State University, Raleigh. She is coeditor of Representing Bisexualities: Subjects and Culture of Fluid Desire and edited a special issue of Jouvert: A Journal of Postcolonial Studies on "Ireland 2000." She has published essays on feminism, film, and performance in Theatre Journal, Cinema Journal, and Screen. Catherine M. Soussloff is Patricia and Rowland Rebele Chair and Professor in Art History at the University of California, Santa Cruz. Her work on European art and aesthetics and their historiography include The Absolute Artist: The Historiography of a Concept, the edited volume Jewish Identity in Modern Art History, and The Subject in Art (forthcoming). Moira Sullivan is a film critic and lecturer based in Stockholm and San Francisco. She wrote her doctoral dissertation, An Anagram of the Ideas of Filmmaker Maya Deren, at Stockholm University, Sweden, in 1997. She is the author of the web pages The Maya Deren Forum and Living Femme Communication. She is also a filmmaker whose work has appeared on French television and in various film festivals. Maureen Turim is Professor of English and Film Studies at the University of Florida. She is author of Abstraction in Avant-Garde Films, Flashbacks in Film: Memory and History, and The Films of Oshima Nagisa: Images of a Japanese Iconoclast. She has published more than fifty articles on cinema, video, art, cultural studies, psychoanalysis, and comparative literature. Her most recent project, Desire and Its Ends: The Driving Forces of Recent Cinema, examines the relation of desire to narrative in different cultural traditions. Jane Brakhage Wodening has six book of short stories to her credit, including from The Book of Legends, which contains this profile of Maya Deren. From 1957 to 1987 she was married to Stan Brakhage and featured in and assisted with most of his work during those years. Ms. Wodening has lived in a tiny cabin at ten thousand feet in the Rocky Mountains for the past ten years and snowshoes more than three miles to her car half the year. Regarded as one of the founders of the postwar American independent cinema, the legendary Maya Deren was a poet, photographer, ethnographer, filmmaker and impresario. Her efforts to promote an independent cinema have inspired filmmakers for over fifty years. Meshes of the Afternoon (1943) ranks among the most widely viewed of all avant-garde films. The eleven essays gathered here examine Maya Deren's writings, films, and legacy from a variety of intriguing perspectives. Some address her relative neglect during the rise of feminist film theory; all argue for her enduring significance. The essays cast light on her aesthetics and ethics, her exploration of film form and of other cultures, her role as (woman) artist and as film theorist. 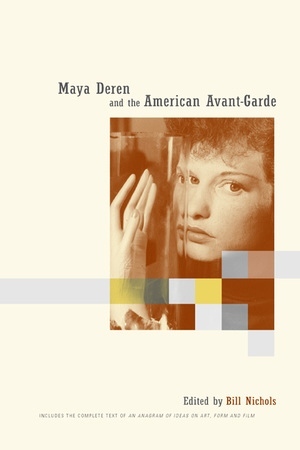 Maya Deren and the American Avant-Garde also includes one of the most significant reflections on the nature of art and the responsibilities of the filmmaker ever written--Deren's influential but long out-of-print book, An Anagram of Ideas on Art, Form and Film, in its entirety. Among the topics covered in this volume are Deren's ties with the avant-garde of her day and its predecessors; her perspective on vodoun ritual, possession ceremonies, and social harmony; her work in relation to the modern dance tradition and its racial inflections; her thoughts, written in the shadow of Hiroshima and Nagasaki, about science, including how form can embody moral principles; the complex issue of the "woman artist" in an avant-garde dominated by men; her famous dispute with Anaïs Nin; and an exploration of issues of identification and desire in her major films. As the first critical evaluation of the enduring significance of Maya Deren, this book clarifies the filmmaker's theoretical and cinematic achievements and conveys the passionate sense of moral purpose she felt about her art. It is a long-overdue tribute to one of the most important and least written about filmmakers in American cinema, an artist who formulated the terms and conditions of independent cinema that remain with us today. Bill Nichols holds the Fanny Knapp Allen Chair of Fine Arts and is Professor of Art and Art History at the University of Rochester where he teaches in the Visual and Cultural Studies doctoral program. He is the author of Blurred Boundaries (1994), Representing Reality (1991), Movies and Methods (California, 1976 and 1985), and Ideology and the Image (1981). "Finally, after all these years, a book from a major American academic press about a major figure from the American film avant-garde! Leave it to Bill Nichols, whose books on documentary have been a major service to the field of independent cinema, to offer us not only a new set of readings of Maya Deren by Annette Michelson, Maureen Turim, Lucy Fischer, Jane Brakhage Wodening, and others but also to retrieve from obscurity Deren's own Anagram of Ideas on Art, Form and Film. It's about time! "—Scott MacDonald, author of "The Garden in the Machine: A Field Guide to Independent Films About Place"